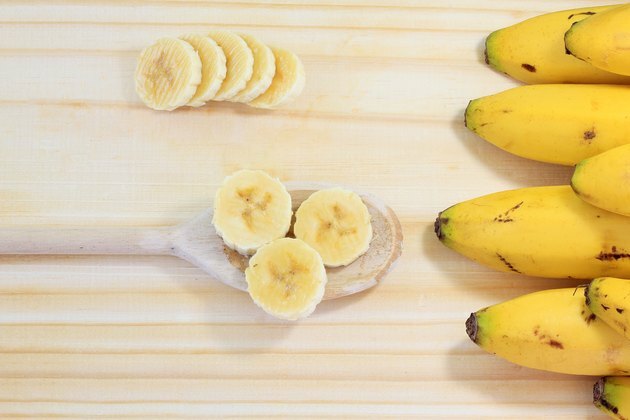 Bananas are nutrient-dense, giving you a lot of nutritional bang for your buck. 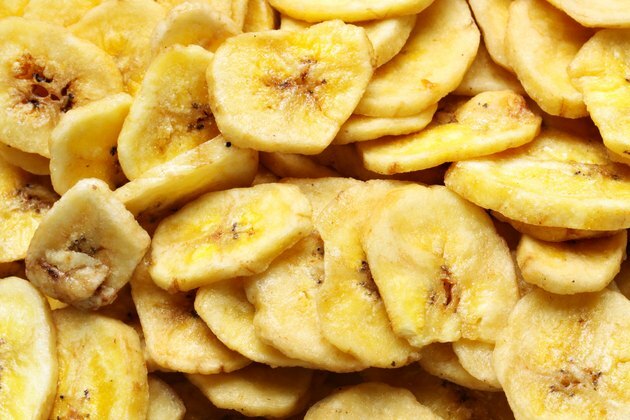 In addition to energy, just one banana provides you with ample fiber, potassium and vitamin B6. So if you were thinking how nice it would be to bake some banana bread, go for it! At 121 calories, one large banana is a mere 6 percent of a 2,000-calorie diet, but it also provides 3.5 grams of dietary fiber, which can help you achieve your weight-loss goals by keeping you feeling full longer. If you're still concerned about calories, choose a smaller banana with about 90 calories and 3.5 grams of fiber. ChooseMyPlate.gov recommends 2 cups of fruits per day for women ages 19-30 and men ages 19-50 (after the age of 30, women should reduce fruit servings to 1.5 cups.). Sliced up, one large banana is equal to one cup (i.e. one serving). At 105 calories, a medium banana has 0 cholesterol and just .4 grams of fat. It contains 27 grams of carbohydrates, which is about 9 percent of the daily recommendation, and 14 grams of sugar, so if you are on a low-carb diet, there are other fruits like raspberries and watermelon that have lower amounts of sugar that you may want to opt for instead. 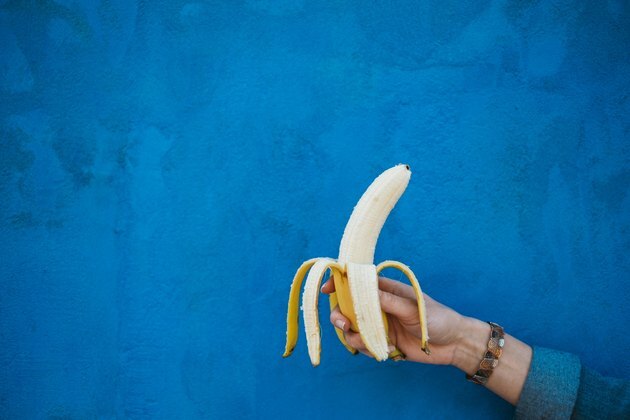 It is recommended that women ages 19-50 get at least 25 grams of fiber a day, and men ages 14-50 get 38 grams — so one medium banana meets 12 percent of your daily needs. Not bad! Less than 1 gram of fat. Additionally, it contains 362 milligrams of potassium which helps maintain the fluid balance in your body. A small banana is equal to a half cup (or a half serving) of fruit, and it will give you approximately 20 mcg of folate and 65 IU of Vitamin A.
Bananas are an excellent source of potassium, an electrolyte mineral that helps balance fluids in your body, making bananas a great post-workout snack. One large banana provides 487 milligrams of potassium — over 10 percent of an adult's daily needs. According to the American Heart Association, a high-potassium diet helps control blood pressure, especially when combined with a reduced sodium intake, because it reduces sodium's effect on the body. A large banana also provides almost 0.5 milligrams of vitamin B6, or 38 percent of an adult's daily requirement. Getting enough B6, according to the National Library of Medicine, is key for a healthy immune system, brain function and the formation of red blood cells. So, go get some bananas and feel reassured they can absolutely be incorporated into a healthy diet! How Many Calories in a Piece of Banana Bread?